With this week’s fashion trend, I’m going to cut right to the chase. While some say that cutout dresses are “so last summer” or super cliché and predictable, I beg to differ. Although I’m not a huge fan of flaunting my back, I do like the idea of showing some skin via a cute and unexpected cutout. From a flirty heart opening on the back to sweet cutouts at the hips or shoulders, there are plenty of styles to try. A dress that allows you to look stylish, while remaining cool and comfortable in the hot heat, is simply too good to pass up! Check out the outfit inspiration below, and invest in one today! At Rodarte and Rolande Mouret’s spring runway shows, cutout dresses were fierce and stunning. While Rodarte presented a mesmerizing blue cutout dress complete with a peplum, Rolande Mouret opted for a body-hugging black dress with striking cutouts in front. Although the cutout dresses featured in this article are more on the casual side, don’t hesitate to invest in some chic options for night. For fancy affairs, stick with cutouts that are subtle and not too revealing. While a black lace dress with an oval cutout on the back is classy, one that’s skin tight, skimpy and covered in animal print is not. With the warm weather, you can often go cardigan-less and wear all the strappy tank tops and dresses that you want. Don’t be shy to show off your back! Pictured above, Kryz Uy of Thirstythought, selects a cutout dress that is perfect for the beach or for a lunch out on the veranda. Boasting a bold floral print and absolutely brimming with color, this cutout dress is eye-catching for all the right reasons. Accessorizing it with an armful of vibrantly colored bangles, a lightweight mustard-colored scarf and white straw bag, Kryz Uy nails this look! Admit it, you love stalking celebs and picking up style tips along the way. While the fabulous clothes that celebrities wear normally exceed our college budgets, doesn’t mean that you can’t obtain their looks for less. Sporting a quirky swan-print cutout dress from Topshop, Dakota Fanning reveals just the right amount of skin. By keeping her accessories to a minimum, she allows for her dress to be the focus (as it should be, those cutouts are too cute!). A black leather handbag, peep-toe wedges and some simple bracelets further contribute to Dakota’s sophisticated and age-appropriate ensemble. Turn heads everywhere with this playful and ultra-girly color block dress. On a scale of one to ten, I’d say that this cutout dress is as daring as it gets! While the cagey, banded cutouts on the back are revealing, they’re still classy and tasteful. Perfect for everything from a dinner date to a day of shopping, this dress is a winner! The two things that we simply cannot get enough of here at College Gloss are florals and cutouts! When the weather’s hot (which, let’s face it, it is basically every day! ), it’s important to opt for clothing that is lightweight, breezy and effortless. While this cutout dress may not be as risqué as the previous selection, it is subtle and understated. With cute triangular side cutouts and an open back, this dress is proof that less is more. 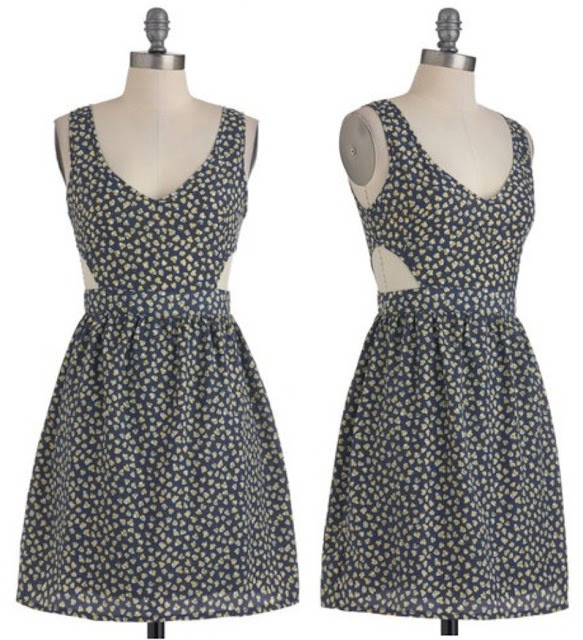 Looking for a casual, carefree dress that you can throw over your bikini and wear at the beach? If so, you’ve come to the right place! This navy blue polka dot (and lady bug) print dress is the epitome of effortless-chic and will take you from day to night. Wear it with gold, embellished t-strap sandals during the day, and then once nighttime hits, trade them in for a pair of strappy wedges and a straw fedora. What do you think of cutout dresses – yay or nay? Let us know in a comment.